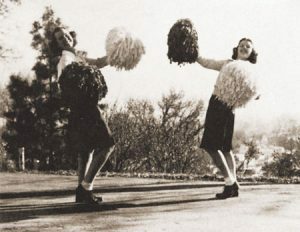 In 1944 Marjorie Hart and Mary Jane Miner decided BYU needed song leaders and became the school's first female cheer team, joining the male yell leaders in rallying Cougar fans. Attending BYU in 1944 was almost like attending an all-girl school. World War II was raging across the globe, and most of the men were in the service, fighting for their country. Fall enrollment hovered around 1,400 students—1,200 of them female. Two of those students were Marjorie (Marje) Hart Clark (BA ’47) and Mary Jane Miner Knights (BA ’48), who grew up together in Long Beach, Calif. Although BYU boys were scarce, having few guys on campus was not a disadvantage. Knights describes how even though it was a solemn time for the country and Friday nights were not used for dates or dances, the female students were able to enjoy their college experiences and create wonderful friendships that have lasted for decades. One of the best memories for Clark and Knights was made in 1944, when the friends decided to bring some cheer to campus. 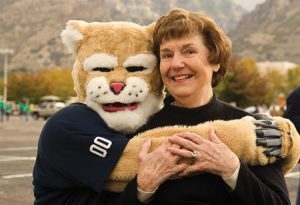 Former song leader Mary Jane Miner Knights attended Homecoming 2008 with her grandson, who is carrying on the family cheering tradition as this year's Cosmo. As the first BYU song leaders, they performed for every home basketball game, dancing and singing in the old Women’s Gym on University Avenue. The duo performed as song leaders for only one year but continued to be involved in other ways. Clark became the first president of the Cougarettes and participated in women’s athletics, while Knights joined the Banyan and Y News staffs and became president of the Senior Women’s Honor Society. But they had pioneered a legacy as some of the first women on the Cougar cheer squad. Through the 60 years since their days at BYU, the two friends have kept in touch. Both women raised families and served missions with their husbands—Clark and her husband, Rand (BS ’49), a former BYU basketball player, served at the Hill Cumorah Historical Sites Mission, and Knights and her husband, Wilford, served in Vienna, Austria. Knights attended Homecoming 2008—pom-poms in hand—and was joined by her grandson, who is Cosmo this year, and the current BYU cheerleaders. She participated in the Homecoming parade and laughed and sang with the students and alumni along the Provo parade route. “Life isn’t over at age 82,” she says. See the Cougarettes' winning 2016 routines.